Yoga Dharma Europe is a yoga retreat centre set in the mountains of Bulgaria. Yoga Dharma has been running yoga retreats and yoga holidays for 13 years. The retreat centre is a fully equipped yoga centre with private rooms, large yoga studio, pool and secluded grounds making it the perfect yoga retreat. The centre is set in a tranquil and secluded hamlet with stunning views across distant vistas. 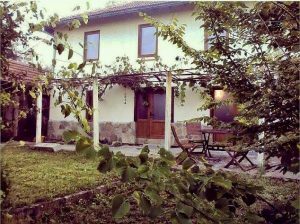 Yoga Dharma Europe is a yoga retreat centre set in the mountains surrounding Veliko Tarnovo, Bulgaria. Yoga Dharma has been running yoga retreats and yoga holidays for 13 years. 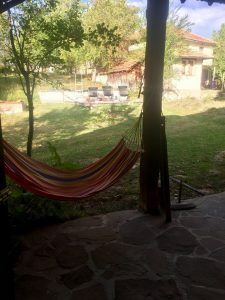 The retreat centre is a fully equipped yoga centre with private rooms, large yoga studio, pool and secluded grounds making it the perfect yoga retreat. The centre is set in a tranquil and secluded hamlet with stunning views across distant vistas. You will experience unparalleled levels of peace and tranquillity. With no roads and few neighbours, each day you will wake to stunning views in every direction. Our centre has everything you need for the perfect yoga holiday. We have our own grounds and orchard. The main garden has a pool and decking. 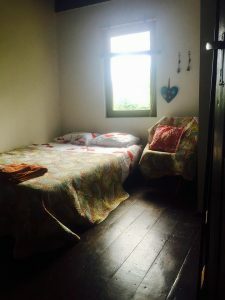 The yoga studio is in our converted traditional barn. The menu is nurturing vegan/vegetarian organic and locally sourced. The garden is full of mature trees and is South facing, making it sunny all day. The centre is fully equipped for your stay. The rooms can be single or shared and are en suite. The cellar is a cool space on warm days and is made up of natural local stone, local timbers make the ceiling. There are videos and a small library. 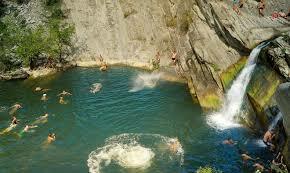 You can visit local places of interest and beauty, such as local monasteries and water falls and spa resorts. During your stay, you will be offered the opportunity to experience the local culture. Bulgaria has a rich history, starting with the original peoples called the Bulgars, who it is said come from the middle east, and can trace their ancestry back to Vedic times. There are Thracian sites all over Bulgaria, as well as Roman remains. High up in the mountains, is a major junction where the paths that run east to west and north to south converge. These paths traverse the length and breadth of Bulgaria, and you can if you wish walk all the way from Spain to the Black sea. It is a place of beauty, where many people converge. There is a wonderful café where we can watch the world go by, and take a walk up into the mountain. The nearest city is Veliko Tarnovo, which by our standards is small. The population of Bulgaria is only about 5 million, and two thirds of the country is still forest. Veliko is a cosmopolitan town with visitors from around the world. It has a rich history, and retains many medieval areas of the original city. You can visit the castle, the gift shops, or the local markets. You will find many modern cafes, with lunch from as little as £3. Apart from the amazing yoga and our wonderful centre you get an insider’s view of the local areas and culture. We set up Yoga Dharma BG 12 years ago, and we have built up considerable knowledge of the people and the history of this ancient area. You won’t be disappointed.